We’ve been really happy with the Wipeable PVC Card, which went down terribly well at Conception at the end of January/beginning of February. 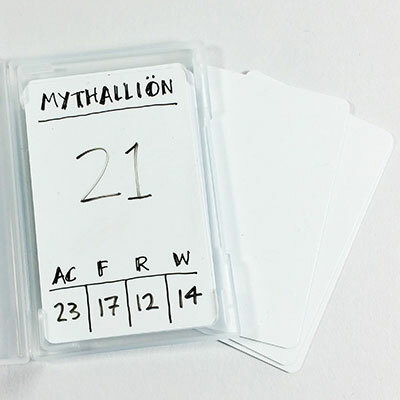 We’ve been frantically looking to source more of the cards, but have had a hard time fixing a supplier and a price. We managed to find a supplier, and we’ve got the stock, but we can no longer subsidise the price. I hope that you’ll still appreciate the value to be had from these reusable, wipeable PVC cards – especially as they compare very favourable to buying packs of sticky notes or index cards. From 23 February 2015, we’ll be adjusting the price to £1.50 per 10 card pack. You can find the Wipeable PVC Cards, along with card boxes, drywipe pens and other tools of the tabletop, in the Accessories section of our online catalog. Hi, just wondering if it’s possible to personalise the wipeable PVC cards? No. Currently we offer blank wipeables only, in two sizes.